However, uninteresting to a mere outsider the history of an individual, or even that of an entire ordinary family, may be, there are, I believe, numbers who feel the poetry and pathos of ancestry, and there are probably few families which do not contain some members to whom details of their own forefathers’ lives would be both useful and interesting, family idiosyncrasy being, I think rarely confined to one generation and often developing strongly were it is retained. I can trace in my own immediate family, and in many of the outside members whom I have known, strong features of our German origin and its influence on characters, often for good and unfortunately often also for evil and lasting through generations. Family life after all lies at the root of all that is good in our existence here, and there is nothing I think better calculated to produce uprightness of conduct than the example of ancestors of good repute, whilst on the other hand their failing and weaknesses which a faithful record dare not overlook may act as a warning to their descendants. There is to me an unspeakable interest attaching to a well ordered family, and all details relating to family matters both past and present, have always possessed a peculiar attraction for me feeling as I do, that I have great cause for thankfulness in the fact of being a member of an unusually large family, in which there was, on the whole, continuous harmony, or at least continuous sympathy and affection both on the part of the children as well as the parents and it has long been my wish to commit to writing some kind of family jottings which might perchance fall into the hands of those who come after me who might partake of my own feeling in such matters. My life has, however, been so much absorbed in business, until my retirement from the city a few years ago, that it has not been possible for me to devote much time to this object. Besides fifty-eight years of unremitting attention to business, may not perhaps have been the fittest preparation for the task I would undertake, and now that I am probably near the end, I can hardly hope to accomplish all that I could wish to do. I will endeavour in the following pages to give some kind of account of the Stahlschmidt family, as far as my own observation and the information I have hitherto collected will enable me to do so, hoping that the dullness of the narrator may be forgiven for the sake of the interest which may here and there attach to the mere statement of facts. The family both in Germany and England has been a very prolific one, but the name in England at least, has not spread so fast as might have been expected, possibly owing to a stronger bodily constitution on the female that on the male side, the women being almost invariably longer lived than the men. A more or less nervously sensitive temperament has distinguished both sexes, and has influenced them considerably in all the relations of life. Hospitality has been a leading feature of their character, and there has been at most times a strong religious vein running through the family, strained, however, occasionally to the verge of sentimentalism. Coupled with a considerable power of self-control there has existed a tendency to the indulgence of the passions which has proved sometimes irresistible, and when once yielded to has entirely enslaved its victim, with very disastrous consequences. But as a rule, there has been kindliness and a general heartiness of character at the bottom and on the whole they have been a persevering, capable clear-headed but occasionally somewhat hasty tempered race, with strong family affections, a decided pertinacity in maintaining an opinion, and although staunch as friends capable also of very strong resentment and when under its influence easily biased towards unjust suspicion and jealousy. That is, I think, a fairly impartial estimate of the general characteristics of the family, developed more or less conspicuously according to circumstance of environment and education, and especially applicable to my own immediate family, owing perhaps to the consanguinity of the parents and it applies also, so far as my own personal acquaintance with a few of the continental relations and the information which I have obtained from other sources allow me to form an opinion, equally to the German and English branches. Through all the generations since that of the Stahlschmidt, the respectability of the family has been on the whole maintained, and although there have been no individuals of undoubted eminence, there have been many who occupied positions of trust and esteem in their own immediate circles. In Germany they have generally taken a keen interest in municipal and ecclesiastical matters, and have in the earlier times mostly engaged in mining and the manufacture of steel. (A firm of steel manufacturers owning steel mines in Westphalia was still running in the name of Stahlschmidt as a limited Company in 1930, the chairman being Ernest or Ernst Stahlschmidt; if suffered however severely from the period of world depression and in May 1931 was placed in the hands of the official receiver, at the instigation of one of the largest creditors. This company made agricultural implements of very high-class grade, well known in Canada and considered of quite premier quality in that market). The only member who, as far as I know, has attained anything like a wide reputation was a Joh. Christian Stahlschmidt, son of one of the Freudenberg branch who travelled a good deal in the East, and subsequently published in 1799 at Nuremberg an account of his wandering and of his somewhat mystical religious experiences which was translated into English as the life and pilgrimage of Stahlschmidt. He was a friend of the well-known Jung Stilling who wrote a preface to the book. The only German descendants of the Stahlschmidt who settled in England were my maternal grandfather and his nephew my father (?) and the bulk of the German branches, probably remain in the country or in the neighbourhood of the country of their origin. Occasionally the name occurs in America and Canada notably in Toronto where a firm of manufacturers of furniture appears to have gained a good reputation. Whence our ancestors originally came cannot, of course now be ascertained with certainty, but I think it most probably that they had always settled in the land of Siegen (Siegena or Sigena) and were descendants of the tribe of the Sygambres, or Sicambres, belonging to and strongly exhibiting all the characteristics of the old Teutonic race, whose war-like habits were matters of constant anxiety to the Romans and the cause of their ultimate defeat. At the time of the general migration of the nations the German people separated; some went from North to South some from East to West, whilst others remained in their original seat. Some of the most powerful tribes formed separate confederations and amongst the number of these confederations one very important one was that of the Franks, which included the Sygambres, or Sicambres and was settled in the region between the woody hills of the Weser and the mountains of the Rhine – the Taunus, the Vogelberg, Spessart and Odenwald, up to the source of the Main. The Franks chose their yellow-haired kings from this tribe of Sicambre and in the fifth century under the leadership of Clodwig defeated the Romans so signally, that their dominion in Gaul came to an end. Ultimately under the Merovingian Kings, the successors of Clodwig, the German empire was founded, Charles the Great being crowned in Aix-la-Chapelle at Christmas 800. That portion of the above-named region which is now known as the Siegerland came at an early period under the dominion of the Counts and Princes of Nassau, first as vassals of the German Emperor and afterwards as independent Princes and today it again forms part of the re-established German Empire. The greater portion of the Siegerland is picturesque and mountainous but it is intersected with pleasant valleys watered by numerous streams and although the soil is not especially favourable to the production of cereals, horned cattle thrive on it, and on the whole it furnishes a not inconsiderable part of the requirements of its population. The climate is bracing and the inhabitants are of a hardy constitution, tall of stature, well formed and strong, with regular features, by nature industrious and persevering, valuing highly all family ties and strongly attached to their native land. If however the country cannot be considered rich from an agricultural point of view, its mineral wealth is very important and mining is consequently one of the principal occupations of the inhabitants and closely connected with mining is of course the production of iron and steel, the latter of which has always had a very high reputation on account of the skill of the natives Stahlschmiede. The steam hammer has now taken the place of manual labour, but the production of steel still retains a considerable place amongst the industries of the country. In former times the craft of the Stahlschmiede was a very notable one and was subject to separate laws and ordinances. There was a special oath imposed upon every member of the Guild (Zunft-Bruderschaft) or Brotherhood by which he bound himself not to forge, or teach the secrets of this craft outside the principality of Nassau and Siegen under forfeiture of body and estates and Siegen made steel, bore the arms of the Grafschaft of Vianden (one of Nassau possessions) in order to distinguish it from inferior qualities. The origin of the craft is hidden in remote antiquity, but from the remains of Schlacke (dross, slag) in various places, amongst others beneath the roots of very ancient oaks, it would appear to have been carried on at a very early date and may have been contemporary with the Romans. In earlier times the manufacture and trade were confined to the interior of the towns themselves, the steel being produced by means of small hand forges. Later on the numerous streams in the neighbourhood of the mines were utilised for the purpose. This ancient craft furnished the patronymic of our family, but it is unfortunately impossible to ascertain how far back they had been connected with it as most of the church and municipal records were destroyed in the thirty years war. The first mention of the name as far as I have been able to ascertain, occurs in the books of the church at Oberfischbach, a small village situated about six miles from the busy old mining town of Siegen the capital of the Principality, and it there figures only as Thones, son of the Stallschmitt of Heisberg (a hamlet close by) godfather to a child Thones, son of Johan and Agnes Loth of Niederndorff, christened on 14th December, 1627.The name occurs again, first on 22nd July 1629, Christin the Stollschmittesse von Heisberg, as godmother to a child Stinigen, daughter of Herman and Agnes Faust of Heisberg; secondly on 13th January, 1630, Stinige, die Stahlschmittesse in Heisberg as godmother to a child Stina, a daughter of Johannes Loss and his wife Weingart Oberheusling. Heisberg is in the district of Freudenberg, a small market town in the neighbourhood also connected with mining, and its concomitant manufacture of steel. The villages of Niederndorf and Niederheuslingen mentioned later on are in the same district. It would appear from the designation of Christine as the Stahlschmittesse that the Stollschmitt died before 1629 and that his widow followed the same occupation as her husband, and from the fact of his being described simply as the Steelsmith, I should imagine he was well known and had attained some notoriety in his calling, and from the further circumstance that on an old seal bearing the family coat of arms which has been long in the family, the Smith is represented as he appeared in the earliest known period of his craft, before the introduction of water or steam power, I should infer that the family had long been engaged in the making of steel and the occupation of the Stollschmitt of 1627 had been of sufficient importance to be removed from the town of Siegen, or more probably Freudenberg to the hamlet of Heisberg aforesaid, through which a picturesque little mountain stream a tributary of the Fischbach, still tumbles, and no doubt in those far off days contributed to the success of the Stahlschmiederei. In Germany surnames did not as a rule come into force, even amongst the aristocracy before the thirteenth century and amongst the citizens, not until the end of the sixteenth century and even down to the close of the sixteenth century many citizens appear only by their Christian names, with the addition of the trade in which they were engaged. There is a tradition in our family, which I have been unable to trace to any legitimate source that its name was originally König and by a strange coincidence there is a point in the manufacture of steel when the glowing mass attains its greatest brightness which was in ancient times called König, but I think that there is little doubt that such name would have been coupled with that of the Stahlschmidt of 1627 if it had been borne by him, and that we must therefore be contented to look upon that individual as the founder of our name, and as a descendant of probably many generations of Steelsmiths from whom he inherited the skill which he further developed and so rose to distinction. The omission of the Christian name would also point, I think to a certain notoriety of the individual in his calling. But although it may not be possible to discover any authentic particulars of the personal circumstances of this ancestor it is interesting to glance at the times in which he was born and at the influences at work during his own and his fathers’ lives, falling as they did in one of the most momentous periods of the history of the modern world. Europe during the two centuries, which preceded that of their birth, was gradually emerging from the chaos of the middle ages, and many forces were preparing the ways for the Reformation of the church and with it the further enlightenment of the different European nations. The invention of printing gave of course an immense impetus to learning and literature and as pioneers in that direction the great name of Dante (1265 – 1321), of Petrach (1304 – 1374) and of Chaucer (1328 – 1400) stand out prominently, whilst as forerunners of Luther himself one of course thinks of our own Wycliffe (1320 – 1384) of John Heiss (1369 – 1415) in Bohemia and Savonarola (1452 – 1498) in Italy, both of which latter died a martyr’s death in the cause of the reformation. The softening influence of art was also making its impression, some of the greatest painters having been born and executed a portion of their work in the fifteenth century Perugina (1446 – 1523) Francia (1456 – 1578) Gwiani Belline (1426 – 1575) Leonardo da Vinci (1452 – 1519) Botticelli (1447 – 1570) Raphael (1483 – 1520) Titian (1477 – 1576) Michelangelo Buonrotti (1474 – 1563) Hans Memling (1415 – 1493) Albrecht Durer (1471 – 1528). The more general use of gunpowder tended also to weaken the power of the nobles especially of the robber class, and serfdom was in the beginning of the sixteenth century almost extinct. The discovery of America and Newfoundland by Christopher Columbus (1445 – 1506) and Sebastian Cabot (1477 – 1557) as well as the sea route to India in 1497/8 by Vasco de Gama (1456 – 1525) round the Cape of Good Hope which had itself been discovered by Bartolomeo Duiza, Portuguese navigator in 1486 although happening quite at the end of the fifteenth century opened a wider field of thought and enterprise and may therefore be considered as contributing to the events if its successor as may also be the rise of the Florentine Republic as well as the strides made towards enlarged powers and privileges by the great German “Hanse” Towns as rivals of Venice and Genoa. Since the foundation of Christianity there has been perhaps no century more remarkable or farther reaching in its influences not only as regards religious freedom but also as far as intellectual progress and the material welfare of mankind is concerned than the sixteenth century in which our ancestor and his father were born. It is true that the whole of Europe was convulsed with religious strife and anxiety during the whole of this and part of the succeeding century, but the good cause of progress was not withstanding marching onwards and thanks to the indomitable courage and energy of Luther and a few of the German princes and nobles, aided by the piety and learning of Melanchton the Reformation in spite of the Inquisition and the Society of Jesuits established in 1535 by Ignatius Loyola (1491 – 1555) ultimately obtained the victory. Martin Luther (1483 – 1546) son of a minder of Eisleben who removed in 1484 to Mansfeld, was sent early to the school at Eisenach where he was first compelled on account of the poverty of his parents to contribute towards his own maintenance by singing carols at the doors of private houses, but under the protection of a well-to-do relative of his mother soon acquired a better position and made such rapid progress in learning especially Latin – that he was removed in 1501 to the University of Erfurt where he became Magister in 1503. At this time he discovered in the library of the University a Latin Bible containing much more than was generally taught by the clergy and by this his thoughts were turned to the study of theology instead of to jurisprudence as intended by his father, but the sudden death of his young friend Alexis made such an impression on him that he resolved to join some religious fraternity and contrary to his father’s wish, he entered in 1505 the monastery of the Augustines at Erfurt. Here he patiently submitted to the rigorous rules of the order and after much tribulation of spirit and remorse on account of his sins, an old monk directed his attention to the forgiveness of sins to be obtained through a belief in Jesus Christ, a doctrine which had been driven out by the fictions of the church on absolution and indulgences. This infused new light and life into him and at the same time he was treated by the head of his Order (von Staupitz) with such mildness and consideration on account of his extraordinary talents and acquirements that he was encouraged to renew his theological studies and in 1507 he was ordained priest. In the year 1508 he was appointed professor of philosophy at the University of Wittenberg, which had been founded in 1502 by the Elector Friederich III Saxony. Here his genius was quickly developed and he soon attracted to his chair a large number of scholars and adherents through his powerful denunciation of the errors of the Roman hierarchy and his assertion of the right of sound understanding. Meanwhile a journey to Rome in 1510 in the interest of his order opened his eyes to the scandals of the Papal court and quite dispelled his respect for the holiness of the Pope. On his return from Rome he accepted the appointment of public preacher at Wittenberg, and in 1512 he became Doctor of Divinity, the oath connected with which imposed upon him according to his belief, the duty of defending the Bible with the utmost fearlessness. His sound learning and extensive knowledge, embracing not only the classics and the ancient fathers of the church but also an intimate acquaintance with the spirit of the Greek and Hebrew languages, together with his eloquent discourses soon made him the greatest scholar of his time. The Emperor Charles V now declared that Luther should be hereafter treated as a heretic, ordering him to leave Worms within 21 days, but giving him that time a written promise of security. On leaving Worms on 28th April his carriage was stopped by friends in disguise who forcibly conveyed him on horseback to the Wartburg near Eisenach where he remained in the strictest seclusion for 10 months translating during that time the New Testament into German. Although the Emperor had issued a final decree of outlawry against him he nevertheless returned in March 1522 to Wittenberg and at once commenced a series of eloquent sermons making at the same time strenuous efforts to alter the liturgy and to purge it of all useless ceremonies. In 1524 he retired from the monastic order an in the following year he married a young nun Catherina von Bora, who had left her convent in the previous year. In the succeeding years 1526/9 he was occupied with Melanchton in framing a new Liturgy and two new catechisms, the Elector Saxony, the Landgrave of Hesse, the Duke of Zweibrucken, the Margrave of Brandenburg and Grand Master of Prussia, together with many cities of the Empire openly embracing Luther’s Reformation. In march 1529 a Diet was convoked at Speyer with the object of confirming the edict of Worms, but it was opposed by the Elector of Saxony the Landgrave of Hesse, the Margrave of Brandenburg and the deputies of the Imperial Civvies who formally protested against a decree drawn up by the Catholic with a view of misleading the Lutherans, and hence the name of Protestant arose and the Reformation became an established fact in Germany, the Confession of Augsburg, dated 25th June 1530 being signed by Johann Elector of Saxony, Georg Margrave of Brandenburg, Ernst Duke of Luneburg, Philipp Landgrave of Hesse, Wolfgang Prince of Anhalt, Albrecht Count of Mansfeld and the towns of Nurnberg, Reutlingen, Kempten, Heilbronn, Weinheim and Weissenburg. In Switzerland Zwingli (1484 – 1531) although differing from Luther on some important points of doctrine and faith, had pushed the Reformation forward until he fell at Capfel, when his work was taken up for a short time by Aecolampadius but was left for completion by a still greater man John Calvin (1509 – 1564). Within a year after which a Bible was placed in every English church by the King’s command. In Scotland John Knox (1505 – 1572) took up the cause with a furriness of zeal and rigid ness of doctrine even greater than that of his personal friend Calvin, whose principles he embodies in the confession of faith adopted by the Scottish Parliament in 1560. Sweden embraced the Evangelical faith in 1527 and Denmark became Protestant in 1536. In Holland the Reformation was widely adopted by not without great persecution under the tyranny of the Spanish monarch Charles V, and especially by Philip II lasting late into the century when the United Provinces threw off the Spanish yoke and declared themselves free under the guidance of William of Orange and after his assassination, of the successor. In France the Calvinistic form of Protestantism was adopted by considerable number, under the name of Hugenots, but under the fickle rule of Catherine de Medici it was subjected to much occasional persecution and was not admitted to full legality until Henry IV secured religious liberty to the Protestants by the Edict of Nantes 1598. The Reformation had thus triumphed over all hindrances and although Germany and part of Holland had still to undergo the miseries of the thirty years war, the supremacy of the Pope was confined henceforth to the Latin races and to parts of the Austrian dominions and religious freedom was established elsewhere in Europe. Turning from the Reformation as the greatest event of the sixteenth century we find this century remarkable also in almost every other direction. It was the century in which besides embracing literature much of work of Luther, Melanchton, Erasmus, Ariosto (1474 –1533) and Tasso (1493 – 1560) actually witnessed the entrance into life of Shakespeare (1564 – 1616) Cervantes (1547 – 1616) Bacon (1561 – 1626) Ben Johnson (1574 – 1637), Beaumont and Fletcher and all the other writers of the great Elisabeth’s reign. In art too, Titian, Raphael, Michel Angelo, Leonardo da Vinci, Albrecht Durer, Hans Holbein, Rubens etc. this century can also claim Harvey, discoverer of the circulation of the blood, Copernicus who thought out the revolution of the celestial bodies, Galileo who practically invented the telescope and the thermometer and the two great astronomers Tycho Brahe and John Kepler. This century was further distinguished by the great blow to the over-whelming power of Spain through the revolt of the United Netherlands and the defeat of the invincible Armada under Elizabeth’s great naval commanders, Lord Howard of Effingham, Drake, Hawkins and Frobisher. Amongst purely domestic matters may be mentioned the introduction into Europe in this century of tobacco by Sir Francis Drake and of the potato by the Spaniards and supposed to have been first planted in England by Sir Walter Raleigh whilst as one of the monuments of architecture the cathedral of St. Peter was being built all through this century having been commenced in 1506 and finished in 1626. Taking into consideration all the influences that were at work during the life of the Stollschmitt, it is hardly possible to imagine that he was not in some measure impressed by them, and that he was probably a good citizen and a man of some enlightenment taking more or less keen interest in many of the serious questions of the day. Education was, at least as far as elementary knowledge was concerned, very general in the Nassau territories, and he may possibly have come into contact with some of the leading scholars of his time. His father must have been a contemporary of the great Luther himself and may even have seen him, or conversed with others who had seen him, and in all probability he did see Melanchton, the great friend and collaborator of Luther, on the occasion of his visit to Siegen, whilst the son may have known the famous painter Rubens who was born at Siegen in 1577 and was therefore in all probability his junior in age, although he may possibly not have remained long in the town of his birth as, after the death of his father he was sent at an early age to Italy where he devoted several years to the study of his art before settling at Antwerp after the death of his mother. As regards the life of the Stollschmitt himself, though it was cast in the troubled times which led to the 30 years war, he will probably have found some compensation in the picturesque natural surroundings of his native place, and above all in the enjoyment of domestic life, which will have been, I fancy, very real for him and it is pleasant to picture him retiring from the toil of the day to the comforts of a home presided over by a wife who was probably a woman of superior endowments and from the affectionate diminutive of Stinigen, by which she was known, no doubt both popular and kindly. Evidently too, the wife must have possessed some energy and capability, as there would appear to be no doubt, as although it is natural to conclude from former entries in the church books, that she was originally a member of the reformed church, the entry of her death on 25th February 1639 followed by the words “ Catholic obit” would point to a conversion to Catholicism which had been recently re-introduced by the Graf Johann der Jüngere. Possibly, however there may have been another interpretation of that additional word, namely that she had always been of the Catholic faith, as apparently only one register used for all deaths of whatever faith the departed might have been. At any rate the addition appears to have been an unusual one, and may therefore be considered as a distinctive mark of a person occupying a certain position in the neighbourhood. The little hamlet of Heisberg is very prettily situated (the situation is now rendered much less picturesque by a wide new military road, cut through the hill and connecting the highroad from Siegen to Freudenberg with Ober Fischbach) amongst the mountains and contains only about a dozen houses, but all of them substantially built, white with intersecting black beams and each with its detached barn and stabling. Some old woman I cam across there in 1877, when asked whether Stahlschmiederei had been formerly carried on there, laughed at the idea, but there is no doubt that the Stollschmittesse was engaged in it up to the time of her death and one likes to think of her thus actively employed and no doubt aided by her son Thones who was prospering in the world and resided at Niederndorf, a pretty little village beyond Fischbach, becoming ultimately Gerichtsschöffe (judge) of Freudenberg, aforesaid where he also devoted himself to Stahlschmiederei. He married Hanna, daughter of Pastor Zeydenbach and his wife Else of Ober Fischbach from which living the father-in-law was expelled by Graf Johann der Jüngere in 1627 dying in December of that year as schoolmaster at Niedertiefenbach (Hadamar). This marriage proves the adhesion of Thones to the Protestant religion apart from the fact that the newly established Protestant clergyman at Ober Fischbach. Matthias* Gudelius was asked by him to stand godfather to his youngest son who was christened (10 October 1647). Thones or Antonius died at Niederndorf and was buried 4 April 1652 at Ober Fischbach. He had in all five sons and one daughter – viz. Heinrich, christened 20 October 1638, married 26 July 1658 to Anna Margareth, daughter of Johannes Weissgerber of Niederndorf and appears later as the Honourable Heinrich Stollschmidt, Judge of the court of Freudenberg and Elder in Niederndorf. Johannes, christened 1 Sept. 1641, married 30 July 1661 to Catharina, daughter of Hannes Rauting of Ferndorf, described in 1685 as the Honourable Johannes Stollschmitt, Judge of the court of Ferndorf. Hans Peter, christened 17 July 1644, married 9 May 1666 to Anna Catharina, daughter of Johannes Beer of Niederheuslingen p.m. of pious memory. Matthias* christened 10 October 1647, married 28 Jan 1673 to Margarethe, daughter of Matthias Weber burger in Siegen where he subsequently lived. Christina christened 16 Dec 1649 buried 18 Dec 1653. The eldest son Johann Georg appears as godfather on 12 June 1649 and was married on 16 June 1650 to Anna Catharina daughter of Nölle (Arnold) and Catharina Cuntze of Niederheuslingen where he resided and were two children were born. Of the two sons, the eldest Johann Franz is our ancestor, the third, Jacob Ludwig, appears to have been very carefully brought up by his parents and showing some talent he was placed with Pastor Otto Wilhelm Sorey in St. Goarshausen with whom he remained till his 14th year when he was sent to the Gymnasium of Herborn for four years. In 1733 he went to the University of Marburg and after completing his studies there, he settled at Frankfurt a/M where several young sons of merchants were confided to him for education. From Frankfurt a/M he went to Meissenheim and there entered the household of Freiherr von Fürstenwerder as tutor to his sons, after which he was appointed tutor to the Gymnasium of Zweibrücken in which position he remained for eight years. (The facts stated here, were communicated to me by the Pastor at Zweibrücken and were extracted from the books there). Jacob Ludwig married on 16 July 1742 Anna Margaretha, daughter of Konsistorialrat and Inspector Johannes Roth with whom he lived for nineteen years and eight months without issues. In 1747 he was appointed by the Landesfürst to the living of Contwig in the neighbourhood of Zweibrücken and after fourteen years of zealous devotion to his congregation during which he gained their entire love and esteem, his ministry was brought to an end on 20 March 1762 by death caused by fever and consumption. The eldest son of Tillmann, Johann Franz, was born 11 May 1700 at Herborn and christened 21 May 1700. His sponsors were Franck Niess, Bürger and Kirchenältester, and Johannes Theodorus Nisius, Prediger in Sprenglingen, Susanne Amelia Minsinger (buried 26 May 1761), daughter of Johann Daniel Minsinger, Stadt Mayor [and tax collector who died on Nov. 13, 1727 at the age of 66 years and 1 day] etc. and his wife Maria Ursula who died 18 March 1734 [at the age of 64 years, 5 months and 2 weeks]. There is no record of Johann Franz beyond the entries of his birth, death and ] in which he is always described a Bürger and Handelsmann or Bürger and Krämer. He died [at the age of 44 years, 3 months less 11 days which is not exact] of consumption [the reason of his death is not given in the church record] and was probably never a strong man, his mother died young [about 1 1/2 year after his birth]. Johann Daniel, born 5 April 1727. Godparents – his paternal and maternal grandparents [Herr Johann Thielmann Stahlschmidt, Inspector zu St. Goar und Fr. Anna Maria dessen Eheliebste wie auch Hr. Daniel Minsinger Stattmajor und Ursula dessen eheliche Haussfrau als des Kindes seitigen Grosseltern]. Georg Friedrich Casimir, born 7 April 1728, sponsors Johann Georg Stahlschmidt, Handelsmann zu Freudenberg, Casimir Minsinger and Christina Maria, widow of Friedrich Fuchs, Handelsmann in Worms. Johanna Maria, born 11 October 1730, sponsors were Johann Sebastian Minsinger, Judge [manor juror, church warden and merchant], and his wife [Johanna] Maria Minsinger of Kreuznach. Johann Jacob, born 5 October 1732. Sponsors were Johann[es] Buhl RathsVerwandter [member of the council] and Rothgerber [red tanner]zu Kreuznach, and Jacob Ludwig Stahlschmidt [S. theol. candidatus]. [Philippina Catharina and] Anna Maria Martha, born 29 September 1736 [christened October 4, 1736 Godparents Hr. Joh. Casimir Achenbach, Kauff- und Handelsmann alhir et uxor Fr. Anna Maria und Hr. Lieutenants Nehrings dermahlin Guarhnison for St. Goar unter dem löblichen murmannischen hessischen Regiment Bodrut? eheliebste Frau Maria Martha], Godmother to Anna Maria (gfc) in 1762. Johann Daniel, born 23 October 1739, [Sponsors were H. Joh. Casimir Minsinger, Bürger und Eysenhändler alhier (citizen and iron merchant) et uxor Frau Anna Maria (and wifed Anna Maria),] died 7  April 1743 and Friedrich Jacob, born 22 July 1741, died 18 March 1742. I can find no trace of Johann Jacob, but as he was christened on the day of his birth, he was probably weakly and died young. The only surviving son appears to have been our direct ancestor, namely GEORG FRIEDRICH CASIMIR, born at Kreuznach on 7 June 1728, christened 10 June (godparents given above). After 8 years education at the Gymnasium of Kreuznach went to the University of Basle where he was under the charge of Professors and Doctors of Theology, Frey, Burckard and Beck. From Basle he went to Strasburg where he studied for half a year before returning home. After remaining at home for a short time, he went to the University of Marburg where he studied under Professors and Doctors of Theology, Kirchmeyer, Ries, Kraft and Schroeder. From Marburg he went to Halle and studied some years under Prof. Michaels Timonish after which he had a desire to go to Holland, but it was appointed otherwise and he ultimately became Informator to Pastor Behamer in Oranienbaum where he remained for a year and a half until he was appointed a school of Sandersleben and was installed there on 9 June by Pastor Waser. Conrad Christian Friedrich, born 31 August 1754, christened 5 September. Godfathers: Conrad Rudolph Gerber, surgeon of Dohndorf, Levin Christian Phoel of Sandersleben, Andr. Moeller, N. von Stenzin. Godmothers: Friederica Juliana Sophia, wife of L.W. Brunor, Johanna Wilhelmina, wife of Rev. Reinhardt. On 11 September 1754 Georg F Casimir was promoted by Prince Dietrich Regent and Guardian as Deacon of the church and Rector of the School of Jessnitz (in the place of F.A.Jerner who was called to…….) and was installed there on 23 March 1755 by Superintendent de Marces and Hofrath Rothen. On 1 September 1758 appointed Prediger of Freckleben by the Regent and Guardian Dietrich and confirmed afterwards by Prince Leopold Friedrich Franz von Anhalt. On 30 August 1764 his wife died after a lingering illness, aged 39 years, and was buried 4 September. Rev. Behler of Dohndorf preached the funeral sermon with a text chosen by her from Psalm 119. On 17 September 1765 he married again. Augusta Adriana Friederica (who died 20 April 1797) was the daughter of the deceased Christian Friedr. Doering, formerly a Pastor and married by Abr. de Marces of Sandersleben. Conrad Christian Friedrich, born 31 August 1754, married to Wilhelmina Seelmayer who died 16 December 1780. Johanna Charlotta Wilhelmina, born 17 June 1757 Jessnitz, married 1785 to Joh. Chr. Poppendick of Volksstedt who died 1786 with her child. Married again in 1788 to Joh. Chr. Schreivogel of Freckleben who died in 1803 in Gussenstadt. Christiana Louisa, born 5 June 1761 Freckleben, married Busch in Nelben. She died 31 May 1839. Anna Maria Amelia, born 9 December 1762, died 25 January 1763. Maria Sophia Christane, born 29 June 1764, died 10 November 1764. Georg August Christian was apprenticed at Michaelmas (Sept. 29) 1787 to Mr. Lincken in Sandersleben and in 1792 for 5 years to Mr. Bahrenroth and in 1794 for 3 years to Mr. Gerriken in Stassfurt. Joh. Wilh. Victor went at the same time to school with Rector Hugel in Aschersleben and afterwards in 1791 to Halle as student. The sponsors at the christening of all these children appear to have been people of standing in society. GEORG FRIEDRICH CASIMIR must have been an interesting man. From all the accounts which have come down to me about him, he was a man of great kindness of nature and one would feel inclined to apply those words of Coleridge to him “He prayeth well who loveth well both man and bird and beast”. “Pastor Georg Friedrich Casimir Stahlschmidt of Kreuznach in the Palatinate 1758 – 1604 entered his ministry on 1.9.1758. He was until then Rector of Jessnitz”. ”Georg Friedrich Casimir Stahlschmidt of Kreuznach in the Palatinate was installed here XXV of Trinity 1758 by the Consistorial Roth and the present superintendent S.L.E. de Marces and in the register of deaths his own is mentioned in the following words: “1804 – 8 May died the Right Reverend Georg Friedrich Casimir Stahlschmidt, the late well-appointed preacher of the parish the legitimate son of Mr. Franz Stahlschmidt, merchant of Kreuznach and his wife Susanna Amelia, nee Minsinger, aged 77 years 11 months and was buried on the 11th of same month by Prediger Naumann of Drohndorf who preached a funeral sermon. Of all the preachers of Freckleben, his was the longest ministry, nearly 46 years. He married first Maria Louise Wilhelmina Brunn, and secondly Augusta Friederika Doering. He had 22 children by the two wives. He had the merit of making arrangements for building a new organ for the church”. The parsonage at Freckleben is a large substantial house with garden and stabling and a huge dovecot in the rear and the life of the old rector will have been on the whole a pleasant one although he lived in troublous times. He was witness of the Seven Years War and of the French Revolution and there is evidence that the first of those events caused some dispute between him and his congregation, a certain Major von Schanwitz having been gartered on him for a night in 1762 for which he claimed 3 thalers, the claim was refused and he therefore sued them at law and gained his suit but they appealed to the Prince (with what success it is not stated) alleging that the Major was not told to take lodgings with the Minister and stating besides that the latter was not attentive to his duties as he should be, hurrying over the services and being often away from home when his services were required for a sudden christening, and demanding, moreover surplus fees than his predecessor. But it does not appear that this quarrel made any lasting impression as he appears just at this time to judge by the christening register to have had highly respectable friends and connexions and all subsequent rumours and traditions point to a general feeling of respect and esteem for him on the part of the congregation. For many years after his death he remained in the memory of the survivors as a very sociable man, fond of conversation and good to dumb animals, especially dogs of which he had a number which sat with him at the window of his parsonage and accompanied him on his frequent walks to his son at Sandersleben (Benjamin Heinrich). As proof of the effecting of these dogs, it is said that after his burial they scratched up the earth on his grave until they came to his coffin. The minister in charge at Freckleben (Stein) confirmed the above in a letter to Hermann Francis Stahlschmidt of 19th November 1873. I have heard formerly, but I forget who was my informant that he was much given to hospitality and that on one occasion on receiving a present of a pig, he invited his neighbours to share it with him and they finished it at one sitting. The same thing occurs with occasional presents of wine. He is said at the same time to have been strict in church and been known to descend from his pulpit for the purpose of rousing a sleepy person during his sermon, but he evidently had no conceit with regard to such sermons, as he left them by will to his son Benjamin Heinrich to be made into paper screws for parcels of grocery. My own father, Christopher Lewis Frederick Stahlschmidt has often told me of the jubilee of the old grandfather of which he had a vivid recollection as a boy of eight, and of the enthusiasm which accompanied it. His family appears, with the exception of the eldest son perhaps, to have kept well together, and he seems to have been careful of their education and welfare. The brothers, with the exception of CCF kept in touch with each other all through their lives, and were all on all occasions apparently willing to help each other too. In the registry of his death it is stated that he had 22 children by his two wives, but he himself has only recorded the births of 17 of whom only 9 appear to have attained their majority, 7 being mentioned in his will made in 1803 whilst the eldest (unmentioned) was then living in London. The daughters appear to have married to his satisfaction and all the sons occupied good positions at the time of his death. The eldest and the third sons became my paternal and maternal grandfathers. The second son, Emmanuel, established a business something between a wholesale grocer and wine merchant at Sandersleben, which was afterwards transferred to his son Eduard as a wine business only at Dessau where it still enjoys a considerable reputation under the old name although it has passed into other hands. This Eduard, who was partly brought up by his uncle (Carl) in Hanover, acquired a considerable fortune, part of which he subsequently lost in some speculation and he enjoyed the esteem of his fellow citizens as well as of the reigning Duke. He was somewhat famed of his taste and judgement in the matter of wines and he was possessed to a rather unusual degree with religious fervour of that kind which is so much in favour with the Moravian Brotherhood amongst whom he counted many friends. He had a very numerous family all by one wife but I knew only two of his sons, Johannes who inherited his father’s talent in the selection of wines, a very genuine man who died comparatively young, and Lorentz who is still living (1901) in Prague as representative of the British and Foreign Bible Society. Another son of Benjamin Heinrich (Emanuel) was Friedrich, also partly brought up by CCS who was given to agriculture and became the lessee and “Ober Amtmann” of an estate (Rittergut) near Halle called Canena where he acquired a great reputation as a breeder of sheep which reputation was subsequently greatly increased in the person of his son, Gustav, a singularly able, upright and hospitable man whose friendship it was my privilege to enjoy for a number of years until he succumbed to a horrid attack of paralysis in 1893. Another son of Georg F. Casimir was Joh. Will. Vic. who after studying at Halle founded a school of some note at Hamburg and went through much trouble during the French occupation and siege, but recovered his position again and undertook in addition to his scholastic duties, those connected with the Vicariate of the German Reformed congregation. His son became minister at Fredericia in Denmark and one of his daughters, Ida, was governess in the family of M. Fairman of Highgate and stayed sometime with us at Peckham after her engagement came to an end. The two boys, Georg August Christian and Johann Rudolph Christian appear to have entered into partnership with each other, but I cannot find in what line and I have no further trace of Johann but Georg was established at Leipzig some years later (died 1850) and his son Eduard who was unsuccessful as a corn merchant at Breslau came to England and remained also for some time with us at Peckham in a somewhat impecunious state. He subsequently, I believe, amassed a considerable fortune in Berlin as proprietor of some public gardens. The two other sons, my maternal and paternal grandfathers will be treated separately on other papers. There is I think nothing of interest to record with regard to those of Georg F. C’s children who died young. CONRAD CHRISTIAN STAHLSCHMIDT, his eldest son, was born at Sandersleben on 31 August 1754, died 23 September 1812, buried at Baker’s Rown, Whitechapel. His sponsors at his christening on September 5, 1754 were, Conrad Gerber, Royal Prussian Army surgeon, Leon Phoel, financial counsellor to the Duke of Anhalt at Dessau, Andr. Moeller, evangelical clergyman of the reformed church at ……Holzklau (? ), Frau von Stenzin, governess at the Duke’s castle at Dessau, Frederica Brunn, Mrs. Joh. Reinhardt, vicar’s wife of Freckleben. His father makes no subsequent mention of this son and I gather from this, that he may have been somewhat unlike his brothers and sisters in character. 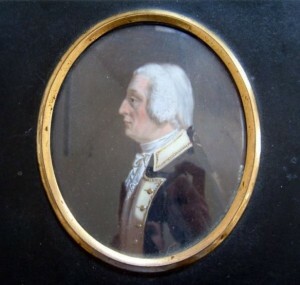 He must however have received a good education (he is said by his son John Charles to have studied at Halle), for he obtained an appointment as Secretary to the Hessian Legation at the time of the engagement by the British Government of Hessian troops for America and in that capacity he came over to England. His son, James Edwin, my Godfather, has also often told me that he was a particularly good Latin scholar. From all accounts he was a man of a somewhat hasty temper but very hospitably inclined. He married first Wilhelmina Seelmayer who died 16 December 1780 and by her he had a daughter, Anna Adelheid Catharina born 9 February 1778 and died 1779. After settling in England he married on 1st May 1786 Ann Miller, born 16 July 1768 died 1849, and leaving the diplomatic service he became a sugar broker in which occupation he is said to have earned considerable sums of money which a generous and hospitable nature soon dispersed and consequently when his health gave way the comfort of the family was greatly diminished and at his death which occurred after a lingering illness on 23 September 1812 their condition was far from satisfactory. The Germans in London were at that time a comparatively small community but from all I have heard he must have occupied a good position in it and should think that his general character combined with his convivial tendencies may have led to that position. His wife, who was his junior by 12 years, was also of a somewhat uncertain temper and although I believe that there was a good deal of domestic happiness, there will have been also occasional dissension. I remember my grandmother very distinctly as a kindly old lady with a high cap and “front” who in our childhood always brought us screws of carracony comfits and was always very kind to us boys when we visited her in our holidays, and in her old age was very vehement in her denouncement of anything like cruelty to animals. When I accompanied her from our house to her lodgings, she has often stood still on the pavement on seeing a costermonger belabour his donkey, or a cabdriver maltreat his horse, shouting “Oh! You brute, you brute! !” After her husband’s death her eldest son, John Charles, and later on my uncle James Edwin, and his sisters watched over her interest and comfort. In my earlier days she came to us by stag coach (no omnibus at that time) and on one occasion she left her reticule in it, containing all her money, but was easily persuaded that it had been recovered, her sons having meanwhile collected the necessary amount. She must have been a very pretty woman and her face was even in old age a very striking one with keen eyes and a mouth, which indicated considerable firmness of character. She was, I have been told by my mother, brought up, or even adopted by an aunt and uncle, but whether of the name Miller, I don’t know. From memory I believe that the aunt and uncle were the proprietors of a company of factors who occupied themselves principally with provincial tours. She had one brother who immigrated, I believe, to China, leaving behind three daughters, Margaret, Eliza and Juliana. The eldest married to Richard Pope and the second remained single. They were all visitors at our house and were always treated there with considerate kindness. I cannot race the Miller family but it is supposed to have been of Swiss descent and was originally spelt Müller. John Charles maintained that the Millers were descended from certain Müllers, burghers of Zurich and Basle in 1615, but that is I think doubtful. Ann Miller had another brother who was a tambour worker at Stepney (Stepney Green appears to have been a somewhat fashionable place at this date). Several of the old houses once rather stately edifices which stood in their own grounds, still remain but in a dilapidated condition and there are occasionally others in rows, dating from the end of the C17y still standing but the whole neighbourhood is in a very low state and is mainly inhabited by Jews. My mother used to tell us of the visits to her aunt at Stepney who lived in a large house (detached mentioned below) with a high-walled garden round it and such a house is still standing there occupied as an asylum for aged Jews. This aunt must have been the wife of the brother of Ann Miller described by my mother as a tambour worker. Her aunt she used to describe as a very kind old lady, small of stature and afflicted with deafness. These may have been the uncle and aunt alluded to by my mother, there are miniatures (of which I have photographs) representing the real couple I believe. I don’t think that John Andrew and Agatha had any other children. The witnesses to the marriage of C.C.F. is also simply Frederick Stahlschmidt. The bride is simply described as Ann Miller, Spinster, without mention of parentage or abode. The christening of Sophia (my mother) took place at St. George’s, Middlesex, the domicile of the parents being New Road, that of Frederick John at St. Dunstan’s Stepney, the father being described as sugar broker of Mile End Old Town and that of James Edwin at St. Mary’s Whitechapel as son of Frederick and Ann, Charlotte St. without stating the occupation of the father. Of the Mr. Miller who emigrated, the eldest child, Margaret, left no children but her sisters, Mrs. Pope had two daughters. Juliana married to a Mr. Corthorn in the dry goods trade and Fanny, wife of Mr. Hemmerde who was some time manager of the Imperial Ottoman Bank and two sons, William, who died in the Crimean War as a private soldier and George, engaged in the hop trade who married Maria, daughter of Henry George (son of CCFS), who died of consumption, leaving a daughter but I have lost all trace of both father (he died 11 February 1903, aged 70, at Hampstead) and daughter. ANN MARTHA born 13 March 1787 died March 1862. LOUISA born 3 May 1788, died 28 August 1867. Ann, born 9 October 1815, died. Ann, born 17 December 1816, died 9 March 1901, aged 86 years. George, born 1 February 1819, died 3 January 1887. Married J. Greentree in 1845 and T. Halley in 1871. David Frederick, born 18 April 1826, died 26 December 1829. Llewellyn Boult, born 8 April 1830, died 11 May 1894 unmarried. Married 1) John Sprigg Feltoe. 2) Robert Blunt. Edith Mary, born July 1831, died 22 January 1834. Married Harriet Hammond King (widow of Capt King.) in March 1863. John Charles Lett, born 9 May 1837, died unmarried 1889. Editha Lett, born 3 April 1842, died 1911. FREDERICK SAMUEL born 31 May 1793 went to sea and not heard of again. SOPHIA born 25 March 1795, died 19 November 1875, married her cousin FRIEDRICH LUDWIG CHRISTOPH STAHLSCHMIDT, born 22 July 1792, died 28 June 1855. Married on 26 July 1817. HENRY GEORGE born 2 March 1799, died at Paramaribo Surinam in 1834. JAMES EDWIN born 3 January 1802, died 13 December 1856 unmarried. He was first engaged at some mining works at Camborne in Cornwall, afterwards in the Adjutant General’s Office Horseguards, the Editor of United Service Gazette. Was a man of considerable parts and enjoyed the friendship of many people of position in literature and in military and naval circles. CARL CASIMIR STAHLSCHMIDT third son of FRIEDRICH CASIMIR STAHLSCHMIDT, born at Freckleben 31 August 1759, died at Hanover 25 October 1836. Married first Anna Dorothea Maria Ulrich, born 16 January 1759, died between 1795 and 1806, daughter of Carl Friedrich Ulrich, “Burger”, “Kaufmann” and “Handelsmann”, and Dorothea Louisa Barteldes (daughter of Rev. Joh. Barteldes of Springe). CARL CASIMIR married secondly Sophia Carolina Marie Trautretter, widow of Hanke. By his first wife he had three boys: Georg Heinrich Conrad, born 19 April 1790, died 11 January 1793. Friedrich Ludwig Christoph, born 22 July 1792, died 28 June1855 and Ernst Heinrich Christian, born 17 April 1795, died 2 August 1813. By his second wife he had one stillborn daughter and two prematurely born children and Carl, born 1 August 1813 who died the same year. I gather from the absence of all mention of it, that he did not study at any University, but he no doubt received some education, probably at Sandersleben. In 1755 was apprenticed to Valentin Semme in Aschersleben and after serving his time was for a little while with Linke of Sandersleben. In 1782 he entered the business of Georg Meyenberg in Hanover and became his partner in 1789 when he married he niece of the former A.D.M. Ulrich mentioned above. The business was a considerable one and would suppose be described in England as that of a mercer and linen-draper, important Government contracts forming a portion of it. There is no record as far as I can ascertain of the death of the senior partner, but I think that it must have taken place before the end of the C18y, as I find no mention of the individual in the correspondence in my possession. The occupation of Hanover by the French caused serious business losses which led in 1814 to a suspension of payments but C.C.S. was held in very high estimation by his fellow citizens and he righted himself gradually and kept together some remnants of his former business almost until the end. He was at one time President of the Chamber of Commerce and held high rank as a Freemason. He was from all that I have heard and read of him a clear headed shrewd man with a good deal of his father’s kindliness and hospitality and decidedly strong attachment to his family, many male members (nephews and cousins) of which found a pleasant home in his house for a considerable time during their education at Hanover. I remember well how as a little child I used to look forward to the annual arrival of Westphalia Hams, Brunswick Sausages and a huge cask of apples (each wrapped in paper by his own hands), which he always sent to my father in the late autumn. He was, my father told me, a somewhat strict disciplinarian but at the same time cheerful and affectionate in his manner towards children and others. He was strong in his friendships and was on terms of great intimacy with some of his fellow citizens notably with two Matthee and Berte who formed with him a trio, which was known in all quarters as the “Clover leaf”. He paid my father a short visit in 1823 and my eldest sister has a faint recollection of him as a smallish figure with a velvet skullcap that could not converse with her on account of his ignorance of the English language. My eldest brother was with him at the time of his death and was very much impressed by the full Masonic honours paid to him at his funeral. FRIEDRICH LUDWIG CHRISTOPH STAHLSCHMIDT the only child of CCS who arrived at manhood was born at Hanover 22 July 1792 and was christened at the “Marktkirche” (St. Georgii et Jacabi) his father being described as Member of the Mercer’s (or merchants) Company or Guild. He was brought up and remained in his father’s business until 1813 when in order to avoid compulsory enlistment by the French he left Hanover intending to go to Hamburg for a time, but owing to the investment of that city by the French he resolved to go to England and reached London after some difficulty on 16 July 1813. He married his first cousin, Sophia Stahlschmidt 26 July 1817 at St. Leonards Church Shoreditch. She was the third daughter of CONRAD CHRISTIAN FRIEDRICH and Ann Miller (FLCS died at 2 Haymarket 28 June 1855, where he was residing temporarily in apartments in order to be near Henry Johnstone who was treating him for stone with an abscess on the kidney). Issue of FRIEDRICH LUDWIG CHRISTOPH STAHLSCHMIDT and his wife SOPHIA STAHLSCHMIDT. HENRY GEORGE born 1 April 1824, died 18 February 1866. Married Sophia Armstrong. RICHARD CASIMIR born 29 July 1828, died at sea about 15 August 1856. SARAH MARIA born 2 November 1829 married Richard Hankins 2 August 1860. LOUIS JAMES born 17 July 1833, died 8 April 1834. BERTHA HENRIETTA born 19 August 1835 married George Cooper 8 June 1865. HERMAN FRANCIS born 6 March 1840, died 15 November 1898. Married Annie Lloyd Coghlan 1887. FRIEDRICH LUDWIG CHRISTOPH STAHLSCHMIDT was a handsome man of the German type fair hair and light grey eyes, with regular features and clear complexion above the middle height 5’10”. In early manhood very spare in body but in middle age and afterwards more than usually corpulent. He was always very active and alert and enjoyed good bodily health. He possessed a remarkable memory and his intelligence and clearness of insight and judgment were of a very high order. Admirable as a father and staunch as a friend he gained the affection and esteem of all who know him. He was well versed in German literature and was able to enjoy that of France, being a good French scholar. As his acquaintance with England increased he became a great admirer of the literature and journalism of his adopted country. Sir Walter Scott was perhaps his favourite author, with the ‘Spectator’ and ‘Examiner’ as weekly papers, which he read regularly. He took a great interest in politics and very warmly supported the liberal cause which led to frequent and somewhat heated discussions especially at the Sunday dinner table during the year which followed the great Reform Bill of 1832. His business capabilities were great and he was most unwearied worker. He mastered the English Language so thoroughly that few people had any idea of his foreign birth and he gained such a perfect knowledge of the Trade and Navigation Laws that when he was established on his own account as a Customs House Agent, the Chairman of the Board of Customs used frequently to send for him for the elucidation of some knotty point and he was also often employed by merchants of eminence to draw up petitions to the Treasury on the subject of the sugar duties on which as well as on the repeal of the corn laws, he had already written at length in 1831 and 1833 to Lord Althorp and he was very widely known and reputed in the city. In the year 1851 he was appointed Commissioner for Hanover and the House Towns to the Great Exhibition, receiving at the close of the same an autograph letter of thanks from Prince Albert as Chairman. As Commissioner he went with the whole body to Paris on the invitation of the Emperor Napoleon III whose interest in Hanover from the questions he put to him seemed to be confined to the famous cream coloured horses. He came also into contact with many of the leading public characters at that time and amongst others Gladstone, who, recently returned from his famous visit to Naples, sat next to him at some banquet and whose conversation impressed very strongly and favourably, particularly all that portion of it which related to Italy. In spite of his close attention to business which absorbed so much of his time, he still managed to take part in much of the work connected with the parish in which he resided, especially during the years he spent in Peckham or Camberwell rather where his clear head was very useful to the National Schools and Guardians of the Poor; but he was not a regular attendant at church, although the ministers of the same often partook of his hospitality which was boundless, and which was in fact one of the weaknesses of his character, as it often led to excess which could hardly be justified either on the score of expense or morality. His generous feelings and his horror of stint often carried him too far, and on the occasion of dinner parties when, as was the custom in the first half of the last century, the wine circulated long after the retirement of ladies, the conversation frequently became far from edifying. But he was capable of great self-restraint, he often used to say, “abstinence is easy but temperance is difficult” and he illustrated this doctrine on one special occasion in a very remarkable way. It was namely at the time when his boys were about to leave school and enter business life and it struck him that it would be a bad example for them if he were to continue the habit of smoking which dated from his youth and he therefore made the resolve never to smoke another cigar after the chest which he last received from the Havannah was emptied. He kept his resolution to the letter and I never heard the faintest sound of regret in connection with it. His strenuous life must have been on the whole a happy one, although he had in it a good deal of uphill fighting. I have no record of his early youth but from what he has told, his home must have been always a very comfortable one. Of this mother, I have never heard anything; she probably died when he was quite a child. There was a good school at Hanover and he therefore received a good education and he retained a pleasant recollection of his teachers, which lasted into later years. After completing his education he appears to have entered his father’s business, I should think about 1808, remaining in it until in order to escape the most terrible of all fates, as he himself describes it, that, namely of being obliged to assist the French who were then in the occupation of Hanover, he left that city hurriedly on 26 March 1813 ostensibly on a business journey. He was accompanied by his cousin JOHN CHARLES the eldest son of his father’s brother CONRAD CHRISTIAN FRIEDRICH and their mutual friend Wm. Matthee. They bent their course first to Sandersleben in Anhalt Dessau where they arrived safely and spent some time with his uncle’s family and at Oberwiederstadt with his uncle’s wife relations, Portins, in the pleasant society of some lively female cousins, but not without anxiety owing to the proximity of both Russian and French armies between which there were constant skirmishes, one of which he was an eye witness. The inhabitants had to suffer much from the soldiery but the knowledge of languages possessed by the travellers proved very useful to them and their friends. The scene lifted however and he and his companions were able to leave Sandersleben on 30 May provided with passports through his uncle there, and crossing the Elbe they arrived the same day at Burg where they met with great attention from his uncle who got their passport visas. Leaving Burg they proceeded in the direction of Hamburg, but were prevented from getting further than Boitzenburg as the French had invaded Hamburg. After trying in vain to get some appointment in the Commissariat (applying to Count Wallmoden as well as to the Commissariat Secretary Meyer) they decided as a last resort to proceed to England. In order to do this they were compelled to go first to Schwerin and then to Wismar whence they sailed on 14 June in the “Caledonia Capt. Aesterstom” for Gothenburg arriving there on 30 June. From Gothenburg they sailed in the “America Capt Ditmar” on 3 July for London, which was reach on 16 July 1813. They lived until 23 October with John’s family, he himself having left at the end of August for Germany with an appointment as Purveyor’s Clerk. From the family of John they moved to No. 85 Bush Street Finsbury Square. On 3rd November the Tower and Park guns announced the victories of 16, 18 and 19 October and great was the rejoicing, with two days illuminations. Then followed the news that Holland had freed herself from the French yoke on the 24th. Park and Tower guns again announced the restoration of the Electorate of Hanover. After a time of considerable anxiety and suspense he obtained on 9 November an appointment as clerk to Mr. Siffken, 12 Bush Lane, Cannon St., a merchant of some standing and a distant relative of the widow of CCF (John’s mother) at a salary of £100 a year, only just enough to make both ends meet particularly as he had in the meantime been obliged to contract a few small debts. The letter to this father 16 December 1813 in which he gives the above details of his journey and is full of thanks to him for having early impressed upon him the lesson of renunciation and for the good education he had received. He describes his life as principally spent in business. Rising early for breakfast he has to hurry off to the office, where they work uninterruptedly till 4 o’clock when an hour is allowed for dinner. Then back to the office at 5 where they work generally till 9 o’clock and often till 10 or 11. This is on Monday, Tuesday, Thursday and Fridays, Wednesdays and Saturday they close at 5 o’clock and on Sunday they do not work at all. His leisure time when he has any is spent in reading writing and occasionally in paying and receiving visits. On Sundays people make excursions into the country, but apart from the unsocial character of the English, the expense of such excursions is too great for him. Walks like those in Germany are unknown here, as the enormous size of the city involves miles of walking before you arrive at the end of the houses. He misses his native walks much. It is most difficult especially for a foreigner, to access into private families and therefore he and Matthee are drawn closer together as they have only two or three other friends. He suggests to his father some purchases of velveteen and calicoes, nankeens and in view of the large number of troops, which it is said, are to be despatched to Hanover to remain there after peace is declared. His principal also makes some enquiries through him about crucibles etc. This letter is sent through his cousin Brunn in Brunen and in it he sends greetings to Matthee, Berte, Holdrich, Wolffer-Sophie and Georg Hancke and to Lotte and “Frau Conrectorin” Kohlbrausch. He alludes to the death of J.H.Benecke also. To his uncle Victor Wilhelm Stahlschmidt in Hamburg he writes on 19 December 1813 acknowledging the receipt of a letter of 20 November addressed to John Charles that it was the first letter he had received from any of his relations abroad since his departure from Hanover (except one from John Charles from Stralsund). He says in this letter that he expected to have been able to return to Hanover after a short absence at the outside 3 or 4 weeks. He left Hanover in order to avoid a horrible fate. His uncle’s letter appears to have been brought over by a young Mr. Edward Lohmann, a nephew of a partner of the firm of Rucker here who has been to call on him (FCLS) which he esteems a great honour. He describes John’s family as in much better circumstances than John expected. The two eldest sisters are married, one very well, the third sister has an appointment in a highly respectable family, one brother in the General Post Office, another is in a very large gold and silver manufacturer’s business. Two boys of 12 and 1¾ years of age are with the mother. The brother next to John went to sea 8 years back and has not been heard of for 7 years, so that they do not know whether he is living or not. The family has gone through a great deal of suffering and richly deserves a better lot. His uncle Victor in his letter of 20 November says that he has heard nothing from CCS since 6 August when he heard that he had lost his wife and that Ernest was dead too. On 26 December 1813 and again on 31 December he writes to his father full of love and sympathy stating that the repeated blows which his father had suffered almost gave rise to doubts as to the goodness of God. At the same time he expresses his great sorrow at the absence of all direct communication from his father himself. At last, however, on 14 February 1814, he received a long letter from his father Ernest and also the fact of his insolvency on 27 September brought about by his domestic troubles and the badness of trade. The struggle was a hard one he says but the step was inevitable. He immediately quitted his house and lived until 30 November in a garden cottage he had hired for Ernest during his illness, and then went to live with Wolffer who had also suspended payment and to whose children he had been appointed guardian. In order to gain a livelihood he had established a sort of tallow candle manufactory combined with soap boiling, and he had some idea of going over to London to see whether he could establish some sort of commission business. A certain Riche, one of his clerks, apparently robbed him and absconded in August, but out of respect for his family CCS did not prosecute him. He regrets that he did not get him admitted into the order of the Freemasons before he left Hanover. He gives the addresses of makers of crucibles, one Georg Throm in Eschwege others in Almerode. In answer to this letter the son repeats the expression of his love and sympathy and bids his father hope. God may have blessings for him in the future of which he may not dream now. Advises him not to come to England, as there is no prospect of business for him. People have lost so much confiscation abroad that they will not execute orders, which are not accompanied by cash. He contrasts the behaviour of principals in London towards their clerks with that in Germany. Here, all that the principals look to is the due performance of their duties by the clerks, they are perfectly indifferent to their mode of living or otherwise and never think of them apart from their work. CARL CASIMIR writes on 16 October 1814 about JOHN’s prospects and says that perhaps the troops will soon be disbanded, and then he might get a pension or some employment from Government and advises him to wait before thinking of or entering an office. His brother from Sandersleben is about to bring his son Friedrich to Hanover to finish his education and on 8 February 1815 he says that however hard he may have been treated by fate, faith in God, in himself and his own strength afford means which enable a man to earn his bread. He has the knowledge that he has always acted honestly according to his strength and that is a comfort to him here and will be one also in the hour of death. Georg Beste perhaps going to London after Easter and will take some snuffboxes. (They were beautifully painted and I well remember them framed, hanging in the dining room) which he has bought for FLC with him. The terms of peace between England and America appear to be disadvantageous to English trade. On 24 July he says that he intends to make a small speculation Kümmel and aniseed and asks whether there is anything to be done in England in these articles. In the meantime the son had been fortunate enough to get a better appointment on 31 August 1814 in the office of Sillem and Grautoff, 14 Mark Lane at a salary of £ 200 a year, and it would appear that in consequence of his increased income he offered in October 1816 to take upon himself the maintenance of his father’s stepson, George Hancke, (during his apprenticeship) who was to have been sent to Hamburg but on account of the many temptations in that city CCS had resolved to send him to his own brother in “Mähren” (Moravia) who had undertaken to get him a place. The father is grateful for the offer of FLCS but says that at present he will manage to pay himself, although he will not scruple to accept the offer if, later on, circumstances should reduce his means, meanwhile he is very sensible of his son’s goodness which causes him great joy and endears him to his heart if possible more than ever. On 2 February the father writes again and discusses the question of coals from Newcastle and thinks of making a trial. This letter cost apparently 5s postage but the coal business does not appear to have come to anything. In the interim FLCS had engaged himself to be married to his cousin SOPHIA that he communicated to his father who asks him when the marriage is to take place in order that he may celebrate the day with the children, and he will pray God on that solemn day to grant his blessing to both. He would so gladly be present at the wedding, but his business duties make that quite impossible. As soon as he is free and if he retains his health he will pay them a visit during the year, if only for a few days for after such a long separation he must see his son again and make the acquaintance of his Sophia and her family. JOHN has written to him to say that James, who had in the meantime been taken into his uncle’s house is to go to Hamburg at Michaelmas (29 September) as clerk in an office but CCS does not consider him sufficiently advanced for that and he will probably go to the brother, the doctor, for preparation. On 31 March acknowledges the receipt of a letter from FLCS in which he asks him to be present at the wedding, but he says that it is impossible, as he has just undertaken the equipment of the whole of the Hanoverian Artillery which will employ him till the end of May, he having to do everything himself. He still hopes to be able to pay a visit to England later in the year. He gives a loving account of James who is most industrious and he thins that he will turn out an able man. He says that the English porter does him good and asks his son to send him more, as he had given away a good deal of that which John had sent him. But he will only accept it on payment of the cost. On 27 July he alludes to the previous day as that of his son’s wedding and is full of tenderness with regard to it. He sends a veil for the bride with all manner of kind messages. Married on the 26 July 1817 the young couple moved into a small house in Monger Street, City Road, a locality which was in those days quite respectable, where their eldest daughter and probably the second daughter also were born. Henceforth FLCS had a most happy married life. His wife, although her education had been neglected and she had consequently no pretensions to scholarship, was a most hearty cheerful disposition with a never failing fund of kindness and not without a sense of humour, shrewd in judgement and a consummate domestic manager, in later life perhaps a little hard at times with the servants, but very kind to them withal. She was short of stature and her face had strong traces of the smallpox, which had in childhood robbed her of a beauty, which was said to have been considerable. As it was she had a very attractive appearance and a very kindly and engaging address. She had a small but beautifully clear voice with which without any real knowledge of music she used to lull her children to sleep. The small income was handled so cleverly that not only were all the necessary home comforts provided, but also a certain amount of homely hospitality was included, and friends and relations were not infrequently entertained in the modest cheerful little house. The wife’s sisters were married, the eldest Ann Martha to Mr. Coles Child a person of some standing in the city, the second Louisa to George Harris of the Stock Exchange, whilst JOHN CHARLES had set up a separate establishment for himself and although some years later there was division in her family they were all united during the first portion of her married life, and her husband personally never lost touch with any of them, whilst with JOHN CHARLES the early friendship was maintained until his death in 1842. Friends mad in business, D H Gaedechens and F W Bencke, fellow clerks in the office of Sillen and Grautoff, and Mr. Lohmann, bookkeeper to the uncle of F W Bencke, and Mr. Cordes one of the earliest acquaintances of 1813 were frequent visitors. So the years glided on until May 1823 when FLCS joined John Henry Drolenvaux, a native of Cuxhaven who was already established as a shipbroker and they combined with this the business of Customs House Agents under the firm of Drolenvaux and Stahlschmidt in the office on the first floor of 2 Mincing Lane one of the old houses built after the great fire of London which has long since disappeared. Both partners were well up in their work, Drolenvaux as the shipbroker, Stahlschmidt as the Custom House Agent, and the business prospered. They had trough D’s connexion the bulk of the Hamburg sailing vessels, and FLCS brought through his acquaintance with many of the German merchants in London, additional shipbrokers business with the northern ports of Russia and with Trieste, as well as a large quantity of Custom House business. For many years there was perfect harmony between the partners, but ultimately differences arose and the partnership was dissolved on 1 January 1853. Drolenvaux taking over all the ship agency business and Stahlschmidt taking over the Custom House Agency business which was then transferred under the firm F. Stahlschmidt to 17 St. Dunstan’s Hill, the dissolution being published in the London Gazette of 18.1.1853. In the meantime the little house in Monger Street had been exchanged for one better adapted to the growing family wants to 26 Penton Place, Walworth where several children were born, and in the beginning of 1820 he paid a visit to his father and arranged some business principally in wool in connexion with or through his relatives in Saxony, which added a little grist to the mill, all the more necessary as his family was increasing very fast. In this house he remained for several years and here his father visited him for a short time in June 1823. Things appear to have gone smoothly for several years though saddened for a time by the death of his eldest son Charles in June 1828, during which time another change of residence took place, probably about 1826, to 2 Montague Place, Old Kent Road, to be followed in 1829 by another removal to 13 Marlborough Place also in the Old Kent Road, this house being in every way superior to those which preceded it. This period was perhaps financially the most prosperous of his life, but it soon became necessary to consider the question of retrenchment in order to face the growing expense attaching to the education of his children, and after five or six years residence in Marlborough Place he removed to 9 Peckham Grove, a small but very pretty house, in which he remained until his death. The Old Kent Road was at that time a semi rural highway with fields and lanes lined with hawthorn leading off it in parts, and opposite the house there was still left one of the old watchmen’s boxes (The Charlies as they were termed) whilst behind the garden in the rear of the house was large dairy farm (Emmetts) occupying that portion of the road on which Glengall Grove etc. are built and from the Lord Nelson public house, a watchman with a lantern conveyed passengers over the fields to Peckham every night at 10 o’clock. Behind the house in Peckham Grove were meadows and cornfields almost as far as the eye could see and during their holidays the boys took blackbirds’ and thrushes’ nests in the hedges, which surrounded them. The 20 years he lived in Peckham Grove were on the whole happy ones, although at times not without some anxiety on the score of ways and means. He soon made friends and acquired the esteem of his neighbours, and in the city he became more and more respected, but the increase in the employment of steamers crippled the business of sailing vessels, whilst the gradual abolition of import duties curtailed the profits of the Custom House agents department, and his income consequently fell off at a time when it was most needed. The father meanwhile was working with all his might and it was really wonderful how he contrived to combine so much business work with his private occupations, for he was not only a constant reader but he devoted a great deal of his time to his duties as host etc. and was always ready to welcome an unexpected guest. The secret of it lay in the fact of his working by night, sometimes all through the night at papers, which he brought home from the office, but it is probable that he shortened his life through this practice. In 1840 his youngest child, Herman Frances, was born and in December of the same year his eldest daughter, Sophia Ann, married John Browne who was engaged in the business of Messrs. Thornton, West India merchants and who was also the right hand of the head of the firm, Mr. Richard Thornton, a man of great wealth and of considerable notoriety in the city. In a few years, all the boys except the two youngest had completed their education and were engaged in business with firms of high standing and with a good prospect of making their way of life. He had given them all a good education and they had thus a fair start. Five of the bays had been for some years under the charge of Mr. Edward Samson, headmaster of the Odiham Grammar School as private pupils, and thus gained a knowledge and love of the country and country occupations which accompanied them through life and added to its zest. Odiham was, and remains until this day one of the prettiest and healthiest of small English towns, situated on the slope of chalk down and in the midst of beautifully wooded country from which fact it derives its name (the town in the wood, Woodyham). The little town is also historically very interesting. From Odiham they were sent for a couple of years to Neuwied on the Rhine were they acquired a thorough knowledge of German and were benefited by further and ampler tuition in other directions. The eldest living boy, Frederick, had as before stated also been in Germany with his grandfather CCS and after a short engagement with a Greek merchant, F Costelli, entered his father’s business. All the younger children also had the benefit of a German finish to their education, the two eldest girls alone having missed that advantage. Thus in 1843 the whole family with the exception of the youngest boy but one, Samuel, who was at Neuwied and the eldest daughter were living in Peckham Grove and no home could be happier than that one was. All meals were simple and of excellent wholesome quality and boys kept late in business, and in those days of foreign post nights they were late, if the family had retired to bed could always reckon finding however late it might be, a hot supper in the kitchen oven, left there by the mother’s orders, an apparently trivial matter but very important in inducing the boys to come home instead of supping elsewhere with their friends and colleagues who were not so fortunate. The parents to attach the children to their home and to promote harmony between them did everything. The boys formed friendships amongst their numerous cousins, the Harrises and JOHN CHARLES’ eldest girl and boy especially, and with colleagues in business, and the girls also had friends of their own so that there was no lack of society apart from the family circle. All pulled well together and had many tastes in common connected with music, the theatre, literature etc. and the father was always glad to take part in their discussions and to give them the benefit of his advice and experience. Notwithstanding, the smallness of the house, room was often found somehow for girl relations as visitors and the evenings were frequently enlivened by music and dancing. Birthdays were always celebrated and marked by a present of some sort as was also Christmas with its unrivalled plum pudding, made from a family recipe superior in the mother’s and consequently in the children’s eyes to any that existed or ever had existed elsewhere. There were always Sunday gatherings with several outside guests, and a previous walk in the rural neighbourhood of Dulwich, Norwood, and Sydenham etc usually whetted the appetites. Theatres and the Opera were visited sometimes in parties, sometimes singly and the merits of the actors and singers formed the subject of frequent discussions. Maercady, Phoelps, Farren, Mrs. Glover, Buckstone and the Keeleys, Mrs. Nisbet were amongst the principal actors. Whilst Grisi, Jenny Lind, Albani, Lallach and Mario were at the height of their fame. A book club was formed by some of the leading parishioners and the principal popular literary works of the day were thus circulated through the house. Carlyle, Macaulay, Thackeray, Dickens, Charles Lever were foremost amongst the living authors read. Whist was also a favourite amusement and friends of the boys often came in for a rubber. In 1848 the circle was broken by the marriage of Henry George to Sophia Perkins Armstrong on 20 November a marriage which the father viewed with much misgiving which ultimately turned out to be a very unhappy one. In 1851 the eldest living son, Frederick John, married Mary Anne Turner, granddaughter of Mrs. Peters of Dorking. This latter year was also that of the great International Exhibition in Hyde Park and one of considerable interest to FLCS who was appointed Commissioner for Hanover and the Hanse Towns. In 1853 the third son, Alfred Augustus, married Sarah Ann Thorp of Thame, a first cousin of Henry’s wife, and in the same year Richard Casimir, after having been engaged in the offices of several firms of eminence (R Thompson, Carter and Bonns and Fred Hath) entered the house of C Uhdorf, of Matomoros in Mexico on the Rio Grande opposite Brownsville in America Territory, changing afterwards in 1856 to James Hale, Texas and drowned afterwards about 15.5. in that year in the Gulf of Mexico. In 1853 the separation from his partner Drolenvaux took place at the same time as the death of Mr. Morman, agent of the General Steam Navigation Company on the Hamburg station, which led to his appointment as his successor. From this time he had increased prosperity in his business, but it was not to last long and in June of the year 1855 he succumbed to a malady of which the seeds had been sown for sometime previously. He died on 28 June at 2 Haymarket having been removed there in order to be near his medical attendant Mr. Henry James Johnson of Suffolk Place, who was treating him for stone in the bladder, but death itself was caused by an abscess in the kidney in which there was and had been probably for some time a mulberry stone of considerable dimensions. He was buried in St. Giles’ churchyard Camberwell, in the same grave with his mother-in-law and of his grandchildren and amidst general sympathy and respect in the parish of St. George as well as that of St. Giles. His youngest son, Herman Francis, who had been for some years at Odiham, was now in the Moravian School at Ebersdorff, whilst Samuel who was engaged in his father’s business went into apartments in the neighbourhood of the office and remained there until his marriage in 1857 to Frances Hankins. The care of the widow and the three unmarried daughters now devolved upon the other unmarried son, Ernest, and they all remained in Peckham Grove until the following year when they moved to 48 Park Road, Haverstock Hill, where they were joined by the youngest brother who on leaving Ebersdorff was immediately engaged by the firm of Frischling and Goschen, old business friends of his father, with whom he remained until his death in 1898. Nine years were spent on the whole, very happily in Park Road and here the third daughter, Maria, was married to Richard Hankins on 2.8.1860. New friendships were made notably that of the Rev. Dr. Stebbing and his family and the neighbourhood was very picturesque and interesting and the air very healthy. The widow was universally beloved and esteemed and although an almost total deafness of many years standing, naturally somewhat curtailed her enjoyment of life, she was always cheerful and full of sympathy for others. She was able to understand her daughters perfectly by the motion of their lips and all her friends and relations contrived somehow to make themselves understood whilst the numerous grandchildren were constantly around her and contributed to the zest of her life. From the St. John’s Park Road the next move was Knowsley House, Quadrant Rd., Nighbury New Park, a very commodious house, with a nice garden and a very pretty view in front of the New River winding through meadows and bounded in the distance by Nornsey Wood with nothing but country between. Here the youngest daughter Bertha was married on 8.6.1865 to George Cooper of Canterbury, a schoolfellow at Neuwied of her brothers, and here too one of the sons Henry George came from Liverpool to die on 18.2.1866 leaving being him a little girl of six (Edith Mary), a bright, affectionate child who grew up to be a light and a joy to her uncle, but whose tragic fate in after years was one of the greatest sorrows of his life. In July 1867 the final move was made to 43 Tavistock Sq. a good family house in a good situation and here the mother lived very happily until the two years preceding her death in 1875 but those last two years were rendered inexpressibly sad by insanity following 24 hours bleeding from the head, and the only remaining unmarried daughter, a good and noble woman followed her in the next year after a life of many trials but of pure unselfish devotion to other, especially to her mother to whom she was strongly attached but who whilst reciprocating the affection was at times somewhat too inconsiderate and exacting. The mother was buried in Norwood cemetery in her son-in-law John Browne’s grave, the daughter at Woking, in the cemetery at Brookwood.